I guess, like all other boaters, we woke to snow falling. The rental car had to be returned to Newbury by 8:00am which made it an early start to the day. I generously allowed myself 30 minutes to travel the 11 miles. All went well until the outskirts of Newbury. From there on the queue of traffic backed up and crawled along slowly. Fortunately I made my deadline with a minute to spare. It was then a case of killing time until 9:30am so I could use my plastic friend (seniors bus pass) to get back to the boat. A trip into the 99p Shop proved to be very fruitful! I purchased two tie-down ratchet straps. These will be used to secure the plastic 20 litre diesel containers to the collapsible sack trolley. There was a 14” steel jemmy bar which might also be useful. And finally there was a length of plastic “cable tidy”. My plan is to use it to tidy up the wiring to the Empirbus nodes. Once back on Waiouru Jan and I had a discussion about the potable (drinking quality) water left in the tank and the weather. The tank was quarter full and Jan wanted to use the washing machine. Do we stay where we are and risk the weather deteriorating even further and potentially running out of water. Or do we move the boat in the snow and fill up the water tank. 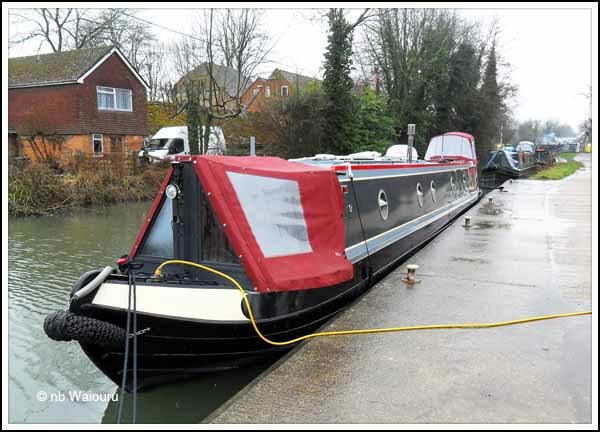 Upon checking the services in the pound we identified the water point was occupied by two moored boats. We would have been prepared to breast up against one of them to reach the water point but considered it might be rather risky for a couple of novices the attempt such a manoeuvre in the snow. The alternative was to go down the lock and through the Aldermaston lift bridge to the second water point outside the cafe. Could we do it in the snow? Well there was only one way to find out. A shivering couple finally managed to get Waiouru to the cafe water point. Of course the snow then ceased and the temperature rose by a few degrees. The cafe water point has only recently been reconnected. We discovered it was very similar to our 3 Mobile ‘All you can eat’ internet data plan. You can take as much water as you like but the speed is dismal. It took 90 minutes to fill the water tank. Still, that gave us time to sit inside, warm up, and have lunch. Whilst there do not appear to be any boats currently moving, we didn’t want to loiter on the water point. Another decision. Do we go down one more lock and wind (turn) to return to our original mooring, or should we reverse all the way back. It started to snow again so obviously we had to take the more difficult option (for us) and reverse back under the lift bridge then up through the lock. It actually went rather well…… With liberal use of the “girlie button” (bow thruster)! The only significant issue during the entire process was the error message that appeared on the Smartbank. The display was flashing the code ‘E11’. This code isn’t in the User Manual? I suspect it’s part of the ‘Advanced’ part of the Smartbank and we didn’t get a User Manual for that part of the system. Google tells me the code means ‘Relay or Battery Cable Problem’ so I need to do some further investigating to identify the exact problem and then a solution. there’s nowt wrong with using the ‘girlie button’ Tom! I'm so pleased we specified the largest 12v BT we could find. It gives the sharp end a darned good push!